Posted in Biennale of Venice, students' work | Comments Off on Biennale-Sessions_2018/6-8JUL: Through the scenic body. Mariangela Melato. Without words. 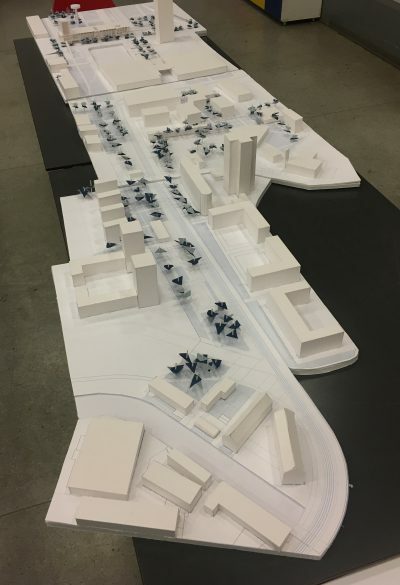 ago, we focused on the regeneration of the popular neighbourhood of San Siro in Milan. spaces of the house in the way they prefer with their favourite furniture. “One function of architecture is to create spaces to intensify the drama of living” – is a quote from an urban design book, and by holding on to this, this housing project presents the ways architecture as function, as form and as program can improve lives of people inhabiting it. 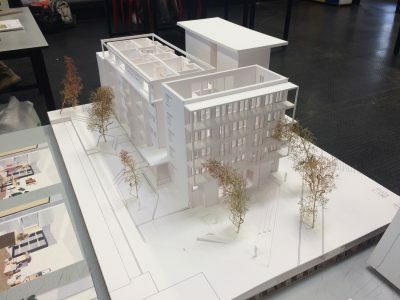 Having approached the design process with a seriousness of considering social sciences readings and successful examples of hybrid buildings working as a small city in a neighborhood, this project contains the study of two important and yet distant generations of our society – elderly and students. This collision of experiences is what makes the community grow even beyond the neighborhood and throughout the city. Elderly are one of the most fragile and precious people of our society, they pass their experience to future generations not only through their words, but for those who are lucky enough to grow around them, also through their style of living and the small ordinary routines. One can learn a certain philosophy of living only by observing an aged man live his day, handle their problems and celebrate their joys. Likewise, one of their priorities in life is to see youth development and improvement, to see their hard work on cultivating principles be paid off. This project attempts to promote this co-living among generations and different profiles of people by creating open, free spaces to live in. This freeness is translated through fluid and gradually changing shapes of the building, having open and enclosed corners of the same floors, community and intimate choices. 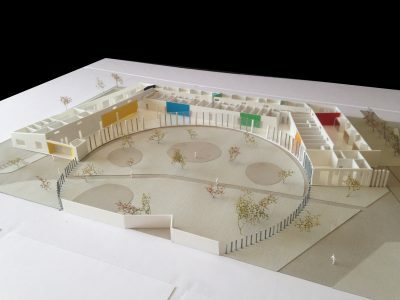 For the people inhabiting the site to be considered as a part of a larger community within the city, the project proposes open public spaces on the ground floor and community gardens taken care of by dwellers themselves. Through prompting different communal activities, a certain interaction is developed and to anyone it feels like home. Eugenio Montale, famous Italian poet and writer who was born in Genoa admires the conflict of the sea and high rise mountains facing each other in Genova and how it is similar to the facts of human individual life and society, also on the other hand in this project we are dealing with two buildings which both of them dates back to fascism area in 20th century with stifling and dark atmosphere. Considering the fact that we are in the 21st century with the motto of democracy and freedom and according to all of these paradoxes in our way of design, we came to a concept of showing the narrow line between lighting and darkness. 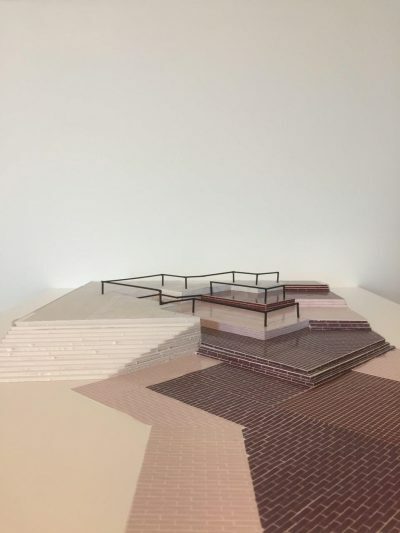 To reach this aim, two buildings and their mountainous connection are considered as a substrate for an exact story with its timeline to bring people to a journey with a new experience of art. Each building plays its own role depends on its features and specialities. With a look to all interior and exterior features and functions of existing building, it is significant that it has almost all the fascism signs such as symmetry, rationality, simplicity and the sense of invitation. so we decided to represent this monument through different exhibitions which are emphasizing The paradoxes mentioned above. We started with bricking the straight pathway to the building which is placing in the domain of the mountain and we made a long journey made of abstract and conceptual elements which are presenting different fascism features of the building with the contrast of freedom and light (thanks to the free and light nature of Savignone). In the next step we define the right side the building as a sign of fascism and the left side of it as a sign of democracy and freedom and we developed our design in the way to let the visitors experience a journey from darkness to the pure light .we added two main volumes to the building which are 2 ramps passing vertically in two wings of the building, the one on the right is struggling with the structure inside the building and tries to pass through it without any touch, the ramp is like a closed box which visitors can feel the stifling and dark atmosphere inside it and in some parts we made it open to show them the various features of existing building and structure.in the end ramp lead the visitors to the resulting room which is exhibited as an installation and each of them can have their own perceptions. 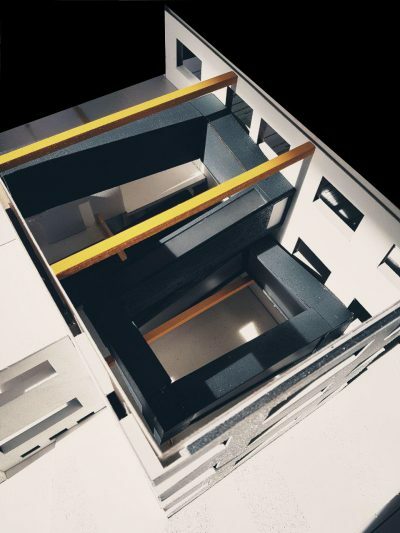 In each floor between two ramps we designed different installation, the visitors can experience the journey from darkness to lighting, closed to open and roughness to softness. 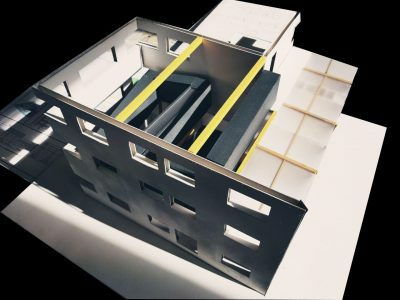 Finally, they will go through the other ramp which penetrates the facade of the building and its flying through nature and light and gives the visitors the best result of freedom. The building is a place for co-working and co-living. 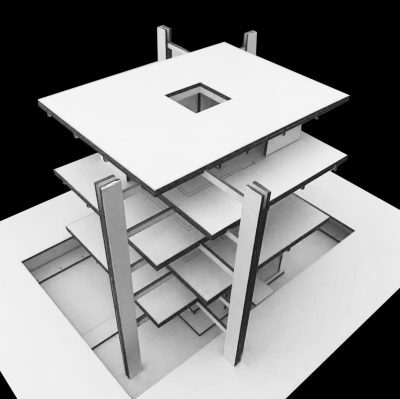 The load-bearing structure of the building is composed of the inside bearing walls and the four outside pillars standing at the two diagonal corners where the beams are free-standing. Two couples of bearing walls stand at the other two diagonal corners on the outline of the structure grid, and the other bearing walls stand at the inner corner of the grid facing the outside pillars. In this way, the two corners where outside stand the pillars are freed from the structure and are guaranteed a good view. The interior partitions are connected at the inner corner of the grid and detached from the exterior walls. Therefore, every rectangular space within the grid becomes a “room” and connected to the neighboring space through the gap between the walls. The rooms are directly connected to each other without corridors, even there can be no interior doors for the rooms because the function of the rooms is carefully arranged and the privacy can be guaranteed by the blocking of the furniture. 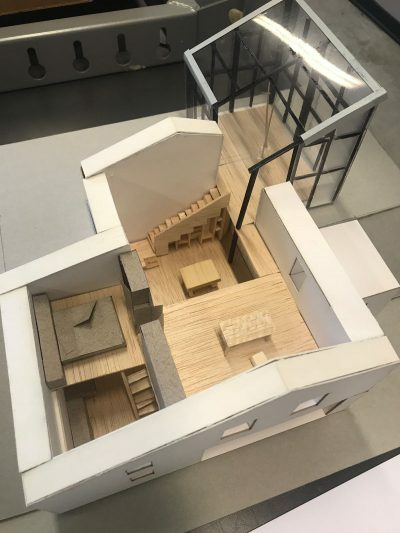 The whole space is separated from the outside by glazing and the bearing walls at the corner while the interior space can still stay as a whole surrounded by the connections between the rooms. And the building stands on a sunken pedestal and surrounded by a sunken garden as if the whole building is separated from exterior environment. For each room, except for the toilets on the corners, the function can be changed freely from a bedroom to a work space, for instance, two neighboring bedrooms, or two neighboring work space, or one bedroom connected with a work space. On each floor, there are two balconies at a big scale extended from the interior public space. As the axial directions of the floors are interlaced, at the balcony, the space is double-heighted and open to strengthen the feeling of the excellent view. The sunken garden is connected to a underground parking lot and some ancillary rooms. The project is inspired by Palladian Villas. Initially, the spaces of the villa were perceived as completely free and open spaces that are shaped by the presence of walls. These free space – regardless of their function – have been ordered and organized by the presence of these walls. Conceptualy we see the space as a “void” and walls as a “mass”. A conceptual model emphasizes the invert power which “void” has , and in this case it is the mass. As an architects we always deal with the mass which modulate the space. Mass can direct or stop people movement, and void is giving a freedom to interact with the space. With this physical representation the aim is to show the size and the power of the free space in our project, but also to show its limits. Another interesting point we can see, is the form of the free space and how it takes shape of the limits that we put. We can say that these two elements, mass and void, are the important points in designing. It is a gift to provide people with practical movement through space, especially when it comes to free spaces then the walls get more meaning because they are the less. 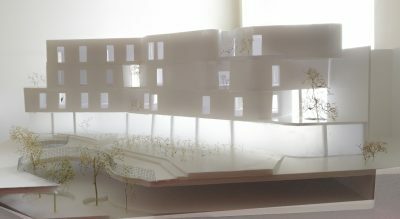 The model represents modern version of villas designed by Andrea Palladio. 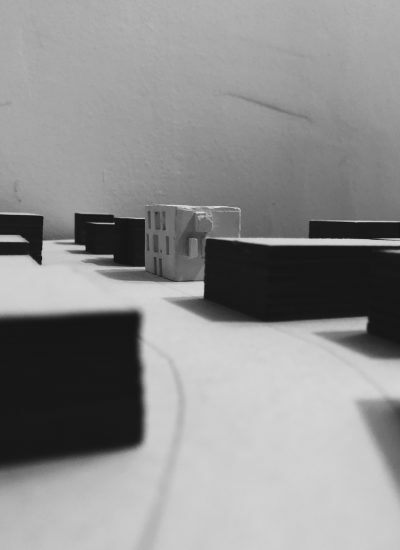 By working with spatial principles of Palladio we created conpemorary villa for cohousing and coworking. 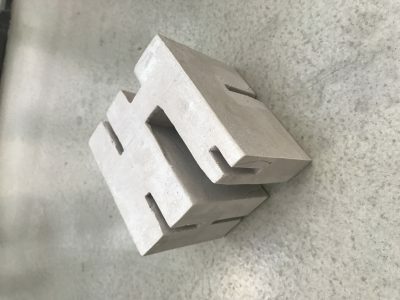 One of the four principles, was introducing central space in the object, which would connect and unify the heirarchy of subspaces created inside. Inner intersection, overlapping and overall dynamic of volume is in the contrast with plane and simple form of the building’s exterior. The central space, is in this case, slightly moved from its geometrical center, but kept emphasized, via cut in the form, visible in the structure, in the facade and experienced in the inner organization. Second microelement, taken from Palladian villas, was presence of water, which back in the days was surrounding buildings. This element is introduced in form of a elongated pool, connecting the building with lake in front of it. Water now becomes at the same time element of interior and of the landscape and creates a dialog between inside and outside. In the context of landscape, pool with its shape, gives the villa monumentality, in a way that, villas of Palladio were uniqly positioned and heighlighted by their context. Surrounded by nature, which came through water element up to the building, breaking it and leaving a mark the villa. Therefore the villa itself becomes a space where water starts , while lake as a place where it ends, or starts again. The project is located in a space donated to the public. Initially used as an anti-aircraft shelter now it has given back as a memory of itself and as an opportunity for reflection and confrontation between past and present. The exercise consists in creating an exhibition on the contrasts. The set-up takes shape from the juxtaposition of two temporal perceptions that, albeit different, tell the same theme: the Terror, yesterday (the Wars,) and today (the terrorist attacks). ZERO-CENTO was born as a result of the inspection carried out inside the ex-refuge anti-aircraft 87 in Milan. The space still tells the events that happened almost a hundred years ago: Terror, Fear and Dismay, were the feelings felt when the alarm sounded. Then, the running to the shelter where many people crammed into a just 30 square meters room. People remained seated for an indefinite lapse of time. They waited helplessly for the slow and inexorable passage of time. A time that by its nature during the waiting times dilates so slow, to be defined as 0. Today the terror is no longer lived with the sound of a siren, you can not even realize what is happening. There are the attacks and there are only the screams, the races and the time sped up, so accelerated that almost does not exist. The TIME 100. Rooms were then created in which the exhibition takes shape, in particular the room of time dilated, the time 0, which wants to give a sense of oppression in a first phase, and a sense of timelessness and spacelessness in a second phase. We find then a filter room, the numbers room, which represents all the numerology concerning wars and terrorist attacks. The last room instead characterizes the time 100, the contract time, represented as a distortion of the user through a myriad of screens representing videos with pieces of news that overlap each other. 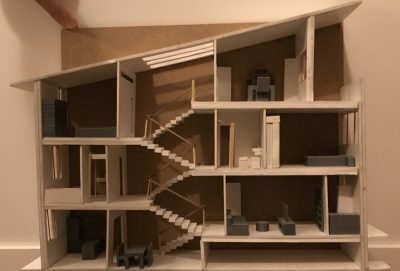 The model represents the interior of Alpine chalet. The challenge was to reactivate and to extend the abandoned chalet, located in National park of Ponte di Legno without touching the exterior facade. 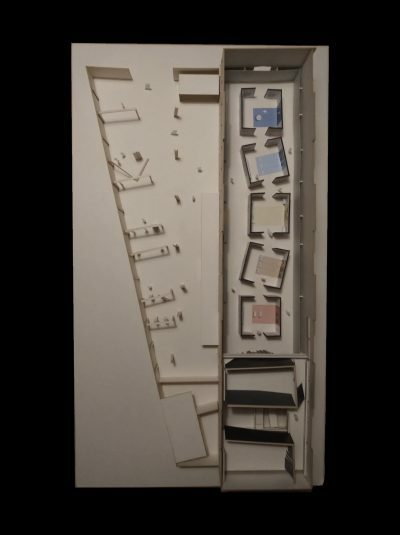 The concept was to organize the space in such a way that there are no formal walls as divisions, but margines which would divide space, but at the same time keep it unified. The furniture is an element itself which modulates the space and is designed to perfectly fit the human scale. 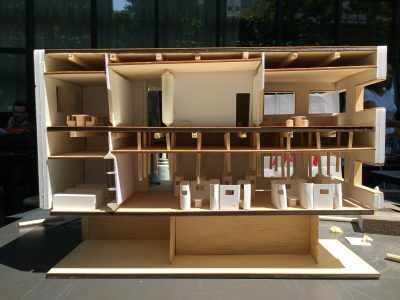 By working on this micro-scale, the idea was to directly influence human needs and to improve quality of usage of space. The secrets of space are created by combination of openings which are not clearly visible, giving the person more privacy by making spatial divisions. For instance, the hidden doors in the closet, which at the same time separates but also connects two different functions, giving the user a chance to feel an unusual experience overagain. In this way we are giving those personalized spaces as a gift to the user. The challenge to show respect to the strong surrounding of Amsterdam and also to host the small dutch collection is completed by the design of ‘in and out’ exhibition house. The specific style and almost always repeated rhythm of facades could not be avoided in the facades of new buildings inserted between traditional villas and churches as it is on this site. The analysis within three-partition, highlighting of the center and diverse treatment of ground floor in the facades is the base which served as a grid. The grid is enriched by removing unnecessary shapes and the rest is drawn-out or inserted according to the use of interior. Anyway, the reaction between facade and interiors is crucial for the presence of the light in the exhibition and its disposition. The ‘outside’ creates ‘inside’ and the influence of the surrounding comes deeply in the flow of space. The main attribute of openings that are not on the front rectangular shape in the plane of facade, but on the sides of the pop-in and pop-outs gives the most significant distinction between fitted-in new and existing old. Something unusual for the traditional architecture came in the core of the building- the three floors void which defined the concept of core and shell together with described story of facades. The known feeling outside and new experience inside exhibition is the result of contrast in the concept of the building. So, what should be more valued by citizens than something domestic-but new, holding the part of national art previously widely spread and lost. Biennale-Sessions_2018/6-8 JUL:Piazza or Living room ?! The Piazza San Matteo is located in Genoa. This piazza is made of a huge platform with 180 cm height and according to the interviews we made with the locals, the area has lack of social interaction.We took the idea of a small, cosy place and decided to shape this square as “living room”.The existing situation does not allow people to circulate in the piazza. While the upper level which in bigger portion of the piazza was only used by the tourist, the lower level was only used as a passage. In order to create a circulation, we designed 3 levels that enables to approach the piazza as a whole, not as parts of two different volumes. Therefore, the levels are created as stairs which are allowing people to climb into the upper levels but also providing seating areas for them. However, we kept a part of the existing piazza which is connected to the preserved area.One part of the piazza remain the same with the same tiles. This area is considered as a place for gathering for the touristic groups and in that area the historical value was conserved. The other part of the piazza designed with levels in colors in order to create a contrast with the existing design and atmosphere where people can hang out. The design of the seating areas are a critical point for our design to emphasize the concept of living room.Since, the area is so small, it is not an ideal choice to put extra seating elements to the area. So, we located the parapets at the edge of every steps. However, they are not ordinary parapets. They are designed as a combination of 2 rectangle frames in order to resemble of a couch’s basic shape. 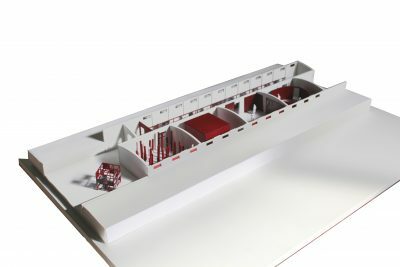 The parapets are also located for the safety reasons.In addition to this, we wanted hide the lighting elements that we are going to design, the best choice is to locate them under the handrails. By doing so, it is possible to turn the frames of the parapet into a couch shaped by light. Posted in Biennale of Venice, students' work | Comments Off on Biennale-Sessions_2018/6-8 JUL:Piazza or Living room ?! and a small open air theatre were considered and studied deeply. free to do whatever he wants. in summer but keeps the building warm in winter. gardening for the community of Trenno.